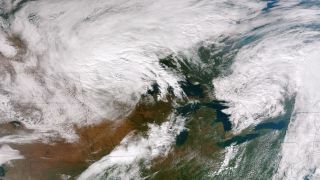 NASA's Suomi NPP satellite captured this image on Oct. 4, 2012, of a large mass of cold air moving south and east across the middle of the country. A large mass of cold air is moving south and east across the middle of the country, and within a couple days could bring temperatures in much of the Midwest and Northeast to the lowest points they’ve yet reached this fall. The cold air mass can be seen as white clouds in the upper left of this image acquired by NASA's Suomi NPP satellite on Oct. 4. This cold front has already brought the year's first snow to Denver and elsewhere in the Great Plains. Temperatures in cities such as Denver, Omaha and Des Moines will dip well below freezing tonight (Oct. 5), according to AccuWeather. Saturday night will be the coldest since April in Chicago, Indianapolis and surrounding areas. The cold snap shouldn't be much of a problem for farmers, though, since they are already nearly a month ahead of schedule due to warm temperatures earlier in the year. The cold air is expected to reach areas of the Northeast by Sunday night, bringing temperatures close to freezing. A cold front of this size is unusual for this early in the year, according to AccuWeather. Below normal temperatures are forecast over much of the country. Snow exceeding 6 inches (15 centimeters) is possible across Wyoming and Nebraska, according to NASA. Late next week, temperatures will rise to more seasonable levels for most areas of the United States.